The winner of this giveaway will receive six new books. These were all double gifts. Good luck! So excited about this giveaway. Entered! Thank you for the chance! Great books. Some are new authors for me. Love Kristin Hannah. Thank you for the giveaway. I think I would really enjoy reading these books. I'd like to win because I love books and receiving a nice new stack is so exciting. Would love to win. And thanks for stopping by @ booklyf.wordpress.com earlier. I'd love to win because I can feel a chick-lit craving approaching ;-) plus I love non-fiction and "A long walk home" intrigued me right away. I would like to read this books because i am a book addict and reading makes me relaxed . They are all new to me and i love finding new reads . I would love to win, because they are books i wouldn't normally read..and they tend to be the ones i'm glad i did read. Because I'd love to win all the books. Thanks for the chance. I would love to win this awesome books cuz I love to read and I know this authors are so good. And it's so hard to find new releases out here in Croatia so this would be a lifesaver. Thank you so much for your lovely giveaway. Because I've got shingles and reading is about the only thing I can do at the moment. Need more books, urgently & these look like my kind of reading material. They all look like books that would appeal to me. I love reading authors that are new to me. I always welcome more books. These books look great. A wonderful way to discover new authors. Thanks for the giveaway! I love reading books without knowing anything about them other than someone with good taste recommends them. The surprise is always wonderful! :) Thanks for the giveaway! I would like to win these books because they all look good, and some are by authors I haven't read yet. Thanks for having the giveaway. I have not read any of these, but several I have heard of and lots of them are by authors that I read. Thanks for the giveaway!! I would love to win them because I love to read and after reading their synopsis they seem really interesting! As I love to read, it's great to escape into the world of books sometimes. My aim this year was to read more and some of these titles look really interesting! I love reading books by authors that are new to me. I'm a bookholics and i would love to win and collect all of those books! Hells, i need new books to read!! I love to read and like to find new authors to enjoy. Well because I love reading. And I also never heard of any of these authors so it'd be nice to read some books by new authors. Thank you for the chance. Cause I love reading books now and then and just a week ago I was short on money for the new books and I've read all the books are there in my local library. Because I haven't read anything written by these authors here, and I love discovering new authors! What a brilliant giveaway - good luck everyone! Reason for joining giveaway? Books! I love books! Receiving books from a giveaway is such a joy. I love receiving new books, all the family share them too. I love to read, discover new authors and mix my genres, so to win would be awesome!! All those authors are new to me, except Kristin Hannah. I love to discover new books and new authors. I love reading and collect books. I also like getting to know new authors. I love books! I haven't been much into this genre lately but it's time to diversify. Because books duh! And they look like great reads! I would love to win! No such thing as too many books right? I'd love to win because I LOVE new books ... and these are all new to me, I might find a new love!!! I love to read books that I haven't actually chosen.They are generally should a delightful surprise. Because I haven't read any of them and would love to! I would like to win these books because I really enjoy reading especially new material. These would be a great start to my collection as usually I go to the library I read so fast. I would be utterly grateful to win these books because i enjoy reading; It has been my go to ever since I was eight. I just love to read and It distracts me from being on social media for pointless hours rather read! I would love to win because books are my only escape, the one thing I do only for me. I love finding new great reads! I would love to win because I love to read books and when Im done reading them I like to pass them along to one of my reader friends to enjoy the books too. I'd love to win these because, after researching, these books look right up my street! They all look amazing, and I love finding new authors to read. I would like to win because one can never have too many books! I would love to win these as I like to try new authors. You guys are cleaning your bookshelves, the reason why i would love to win books because i don't have a bookshelf. 😢 I don't have lots of books to have one. Thanks for this chance! All the best! They look like great reads! I love to read and books can be expensive. I'll try anything for a read - thanks for the recommendations. I would love to win these books because I am working on building up a book collection for when I am bored. I have run out of books to read currently. I would like to win these books because I have heard of these authors but I haven't read any of their works. always like reading new things! Because who doesn't love getting new books that all sound fabulous?! I'd like to win because I haven't read anything by any of these authors. I like finding new books to read. I'd like to win because I love books and I just cleared room on my shelves for more. Im trying to aim to read more this year! I'd like to win because most of these are new-to-me authors. Because they look like good books and I love reading. I love read. This books seems great and actually my goal in life is to build my own home library. My parents are encouraged me to begin now. That's why I really want to win this books. That and the excitement of read them!! I love to read everything and there's a few authors there that I've read before, so I'd love to try these books. Authors I haven't had the pleasure of reading yet. :) Doesn't sound a big thing but I read 4 books a week (not including Kindle ones) so finding new authors is a harder job than it sounds. :) Thanks for the chance. Because I heard great things about these authors! I seem to have re-discovered the enjoyment of reading and it would be lovely to add these ones to my bookshelves. Because these looks like a good reads! I like all sorts of genres, but am always looking out for new authors I haven't tried yet. Since I love to read, I enjoy finding new books and authors to add to my collection. Thanks for the fantastic giveaway! I want to win these books because they look really good and I need something new to read. I love books and I love to read, I donate some of my books that I win in giveaways to my local library. Its very hard for me to part with books but our local library (even other libraries) can really use it. They're all by authors I'm unfamiliar with so would love to try them! Because they look absolutely lovely! I like reading all types of books. 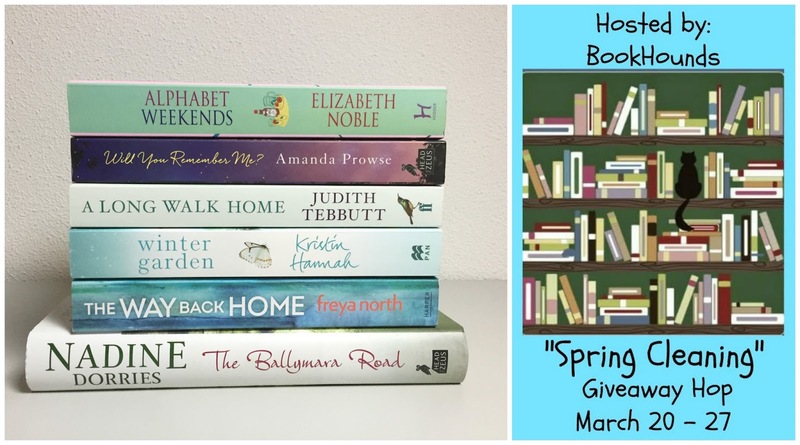 I would like to win the books because I'm an avid reader and can always use more,especially now that it is getting warmer and I can spend time reading outside. I always struggle to chose books so it would be good to have some chosen for me. I'd like to share them with my mum who sadly lost all her books.